Charlie Austin scores Southampton's winner against Arsenal. Watch Charlie Austin's goal that ended Arsenal's 22-game unbeaten run.. It was the Londoners' first defeat in 23 games and meant they lost ground on fourth-placed Chelsea, while Southampton moved out of the bottom three. 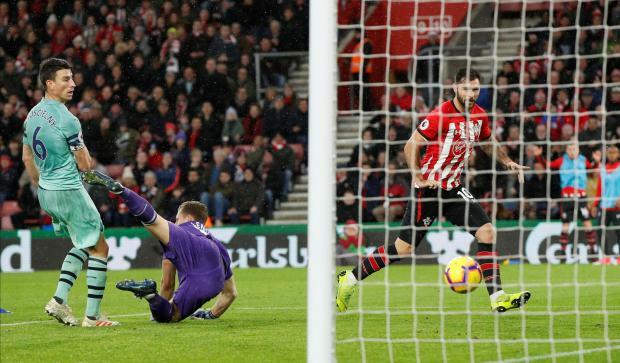 A first win in 13 league games since Sept. 1 sent Southampton above Burnley into 17th place while Arsenal, who had last lost to Chelsea in the Premier League in August, remained fifth in the table. As a consequence Emery made one of his regular halftime substitutions in sending on Alexandre Lacazette for wing back Hector Bellerin, and Aubameyang almost equalised within a minute. Mkhitaryan's second goal was fortunate in the extreme, his shot taking a big deflection off Jannik Vestergaard to leave goalkeeper Alex McCarthy helpless. "As a club we know the position we've put ourselves, and with the squad we've got it's not good enough," said Ings. "But if we keep showing resilience and hard work we can turn it round. It shows we're moving in the right direction already." "We're frustrated the unbeaten run is over," he added. "We had chances to win the game. But we should give ourselves some credit for going on the run."